I was knocked out with a flu-like cold almost immediately after returning from a fascinating visit to London during which we visited Petticoat Lane Market, Spitalfields Market and the interesting streets around it, as well as the Science Museum where Lucy Imogen was enacting the story of Svetlana Savitskaya. We stayed at Maple Street Apartments which meant that we had several very enjoyable meals at the Gogo Lebanese Restaurant in Cleveland Street. The main reason for visiting London was to attend the preview of an art exhibition at the Royal Academy – more about that later. We decided to go by train and stayed at a self-catering apartment near Euston Station. The journey from Northallerton to London was comfortable thanks to Grand Central – as compared with returning home on an East Coast train where the seats were more cramped and the carriages over-crowded. 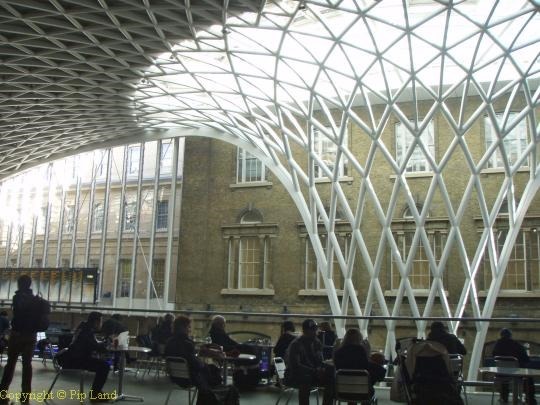 The journey home, however, did give us an opportunity to appreciate the renovated Kings Cross mainline station (left) while enjoying a light lunch at Giraffe. Our first view of Maple Street Apartments was off-putting to say the least. There was no sign on the drab door and above it was a To Let notice. When the door was opened we could hardly squeeze in due to the large boxes which had just been delivered. But Fabio was very helpful. We were grateful that our apartment was on the ground floor and was very clean and bright, with plenty enough in the kitchen as well as a comfortable bed. Due to the lack of double glazing, curtains and carpets there was quite a bit of noise both within the building and from the busy road outside but there was the bonus of being close to several supermarkets and restaurants. When we returned to Maple Street after the preview we were tired and hungry. Thankfully, just round the corner in Cleveland Street, we found the small but very welcoming Gogo Lebanese restaurant with its wonderful selection of very tasty vegetarian meals. David was a picture of delight when Maria placed a plate of Halloumi Grill in front of him. And Yousif, the chef, took good care to provide me with food that I could eat. In fact he was so good to us that we went back every evening. By the third night Yousif even specially prepared some kebabs for me. His saffron rice was particularly memorable. Another good feature of Maple Street Apartments is its close proximity to several underground stations such as Great Portland Street, Warren Street and Goodge Street. 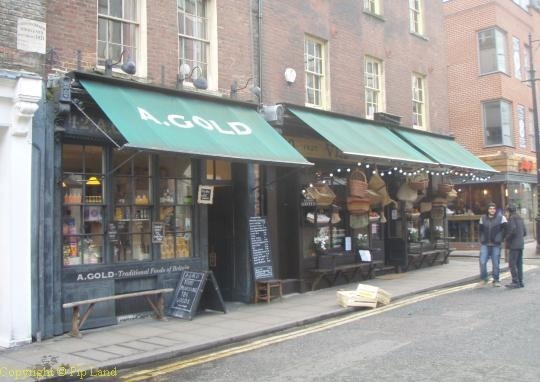 As David was keen to make his first visit to Petticoat Lane Market we took the Circle Line to Liverpool Street one day and began a gentle, meandering walk of discovery. This took us first into Devonshire Square. This remarkably good fusion of old warehouses with modern offices and restaurants provided an introduction to how the City of London is encroaching into Spitalfields leading to gentrification of yet another working class area. This was even more evident once we reached Wentworth Street where the Petticoat Lane Market is held on week days. We weren’t at all impressed by Petticoat Lane market and far preferred the Spitalfields Market – old and new. On our way to Spitalfields Market we stopped for tasty lunch in the light and airy Java U restaurant where the staff were very helpful when we listed our food allergies and intolerances. At Spitalfields Market we followed the crowds into the Tiger store and soon found out why it was buzzing. We were fascinated by its range of innovative products all at such cheap prices. On our walk from Wentworth Street to Spitalfields Market we were very aware of the towering presence of the City thanks to skyscrapers like the Gherkin. 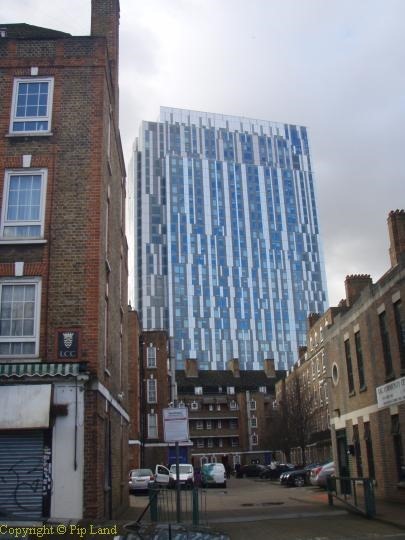 We turned into Toynbee Street and at the entrance to the Brune Street Estate marvelled at how small it looked compared with the 34-storey high Nido Student Accommodation building (below left). This is the third tallest student accommodation block in the world (the first is in Manchester and the second in Leeds). On Fridays the road into the Brune Street Estate becomes a large open-air mosque for these days this is part of Spitalfields Banglatown. Ever since the Huguenot refugees from religious persecution in France began building their homes on the fields outside the City walls in the late 17th century this area has seen waves of migrant workers. Some of the protestant chapels built by the Huguenots became Methodist chapels, then synagogues and now mosques following the influx of Bangladeshi immigrants in the 20th century. In the Victorian era Spitalfields became renowned for its slums with the large terraced houses built by wealthy Huguenots becoming the overcrowded tenements and Rookeries of the poorest of the poor in London. But that doesn’t mean that this area did not retain its rich heritage of historical houses and warehouses. Many of these have now been included in conservation areas – but sadly are still under threat from developers. 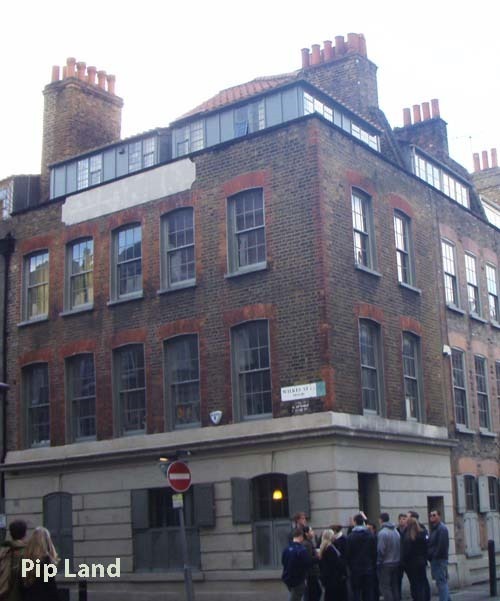 British Land has, for instance, submitted plans to demolish a large part of the distinctive streetscape in Norton Folgate (in a conservation area) and replace it with a modern corporate plaza (see links below). The juxtaposition of the old and new made our walk very interesting. 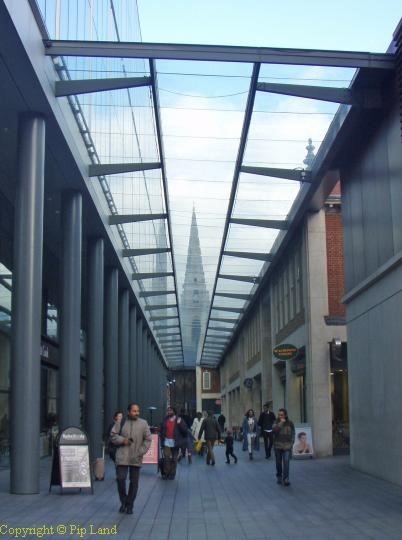 But we also saw how large parts of the fascinating street scene of Spitalfields have already been lost. Who knows what the future holds for Spitalfields now that the yuppies of the City of London have begun to take possession of it. We hope that many of those old buildings will be protected – but like other parts of working class London it is likely that the process of gentrification will continue. But where will those on lower incomes like carers and nurses find accommodation in this yuppified metropolis? The Georgian homes of rich Huguenot silk weavers and mercers with their glazed attics like that at the corner of Fournier Street and Wilkes Street (above right) revolving back from apartments to being “des-res” town-houses at over £2 million apiece. 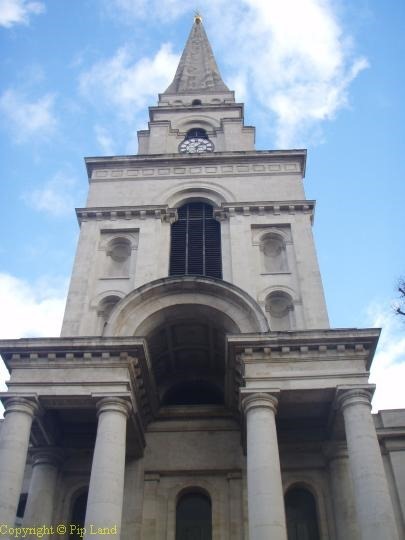 For almost 300 years the imperious Christ Church designed by Nicholas Hawksmoor in the early 18th century stood like a lonely sentinel over Spitalfields. It still has a dramatic impact upon the landscape despite the City skyscrapers overlooking it. Sadly it was closed in February due to repairs on the organ. Below: l-r Christ Church; overlooked by the Nido building and the top of the Gherkin; and the church as seen from the new part of Spitalfields Market. It was the industrial revolution which led to Spitalfields becoming a slum area and it was the fascination of those great engines which were so important in that world-changing era that led us back to the Science Museum during our visit to London. with its comprehensive collection of 18th century scientific apparatus. There it was possible to see how 18th century scientists played with the ideas which would have an impact upon the industrial revolution. We could have learnt one lesson from all hundreds of school children who were at the museum that day – and that was to bring one’s own food and drink. It cost us £13 for a cup of coffee, a pot of tea and one slice of carrot cake! A good plate of food at Gogo cost less. We spent the rest of our visit in the section dedicated to air flight with David especially fascinated by the unique collection of 80 significant aero engines while I wandered off to look at the various aeroplanes. We didn’t return to the museum’s restaurant but found a Chopstix restaurant near South Kengsington station. This is a very basic restaurant serving ready prepared Chinese food in a box (£5 for two items). David wasn’t too impressed with the vegetarian option whereas my meal of noodles with caramelised chicken was very enjoyable. But then David had the pleasure of looking forward to another superb vegetarian meal at the Gogo restaurant that evening.